All of the Manhattan Els had extensions or connections in the Bronx. The first Subway still has its elevated structure running up Broadway to Van Cortlandt Park Terminal. However, some of the original Elevated extensions, connections and terminals in the Bronx have been gone longer than the number years they existed. Some Railroad Lines and terminals have also disappeared with the passage of time. 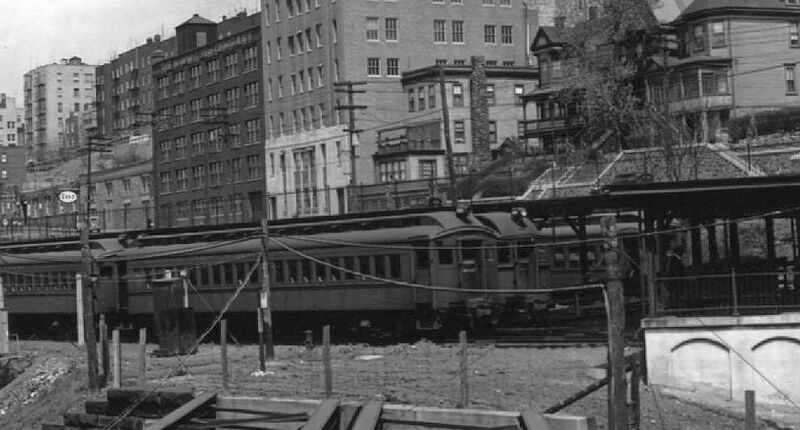 Trolleys disappeared from the Bronx in 1950 with exception of the link to the TARS Yonkers System in the Northern Bronx. However, some lines disappeared or were cut back earlier producing forgotten routes and terminals. This web page identifies those rail lines and terminals that may only be known to a handful of people, and in some cases, there may not even be a trace of the line. We will attempt to provide photographic or some visual evidence of these forgotten lines and terminals. The first line that has a “Forgotten” past is the New York Westchester & Boston RR. The Bronx section of the line north of 180th Street to Dyre Ave & 233rd Street was taken over by the New York City Transit Authority in 1939. However, the lower portion of the line from 180th St south to the Harlem River Terminal that was shared with the New York, New Haven & Hartford RR remined unused over 50 years. That ROW was planned to be a part of the fabled Second Ave Subway. The image above shows a NYW&B car beside the Terminal building shared w for the NYW&B. The Hew Haven RR Harlem ith the NYNH&HRR. The Shuttle to 129th St was replaced by a covered walkway to the 133rd St Stataion for the NYW&B. The Hew Haven RR Harlem River Terminal dates back to the mid 19th century when the it was the terminal of the Harlem River & Portchester RR. An interesting aspect of this terminal was that the NYNH&HRR had a connecting track to the 3rd Ave El on the Bronx side of the El Harlem River Bridge. This connection was an early attempt by the New Haven RR to secure access to NY City via the 2nd Ave El. The New Haven RR origianlly provided a steam powered shuttle to the 127th St El Terminal across the Harlem River Bridge beginning in 1886. The El shuttle was in service from 1889 to 1924 from the 129th St Terminal. A gate car is shown on the connecting track approaching the 132nd St terminal. 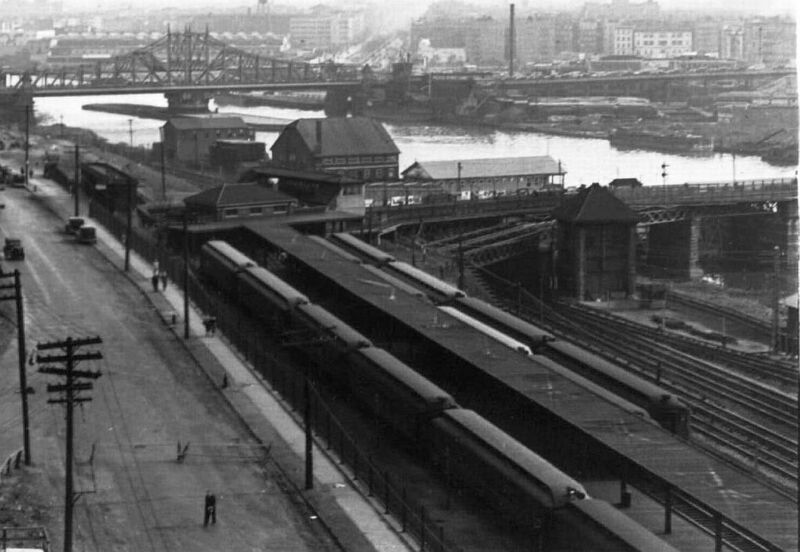 The track remained in non-revenue use until 1955, when the 3rd Ave El bridge and structure in Manhattan was demolished. The connecting track ramp remained as a coal siding for many years afterwards. Another forgotten railway terminal and elevated rapid transit link existed at Sedgwick Ave at the Harlem River in the Bronx. The terminal was for the short lived (1926-1943) electric passenger operation of the Yonkers Branch of the Putnam Division of the New York Central RR The Ninth Ave El was extended across the Harlem River from the 155th St Terminal at the Polo Grounds to connect with the IRT Jerome Ave elevated extension of the Lexington Ave Subway in 1918. However, the bridge that carried the the El over the Harlem River was originally built by The New York City & Northern RR The bridge opened on May 1, 1881. The NYC&N RR became the northern end of the Yonkers & Westside Patent Railway, the original name of the Ninth Ave El. The image above is an overhead view of the Sedgwick Terminal and the former NY&N Bridge and the Sedgwick Ave station of the El. The former connection to the NY&N ROW can be seen at the bridge. 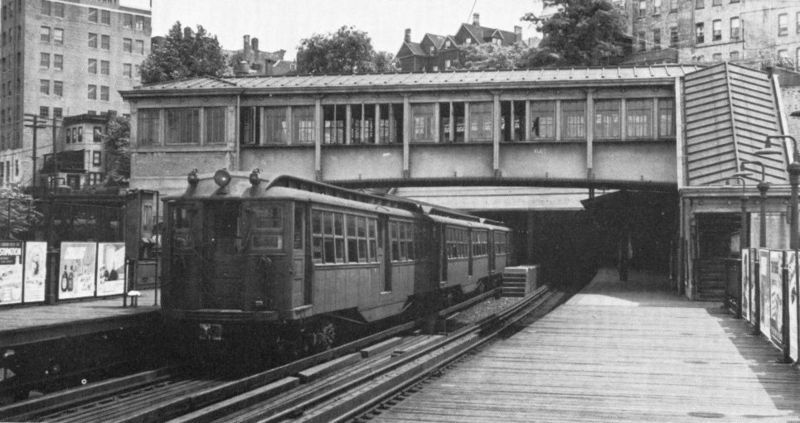 After the Ninth Ave El ceased operation in 1940, the connecting line to the Jerome Ave Line from the 155th St Station across the bridge became known as the Polo Grounds Shuttle. Passenger service ended on the Putnam Div in 1958 and the Shuttle service was discontinued and the bridge and the 155th St El station were removed. This is a view of the Sedgwick Ave Passenger Terminal of the Yonkers Branch of the New York Central RR Putnam Division. Th view is looking North east from the bridge showing the stub of the former connectionto the railroad. The NY&N maintained a steam connection to the 155th St terminal until 1916. The passenger terminal was built here to replace the former El connection and to accomodate the Yonkers Branch passenger train service. The original ROW ramped down to the New York & Hudson River RR ROW where a connection could be made to that line at the Highbridge Station. A Sedgwick Ave Station was also built on the Hudson Division ROW (see below) to accomodate the Yonkers Branch transfers. 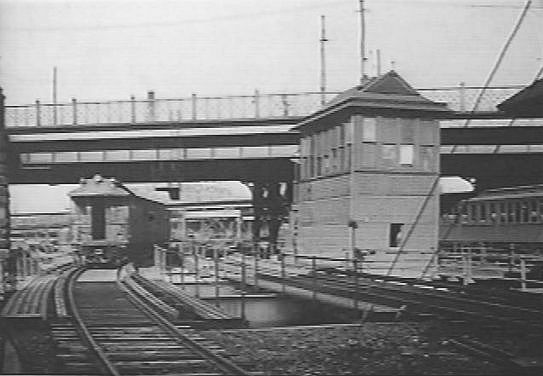 The Yonkers Branch was electrified in 1926. The image shows New York Central electric MU cars in the station. The Yonkers Branch ceased operation on June 30, 1943. 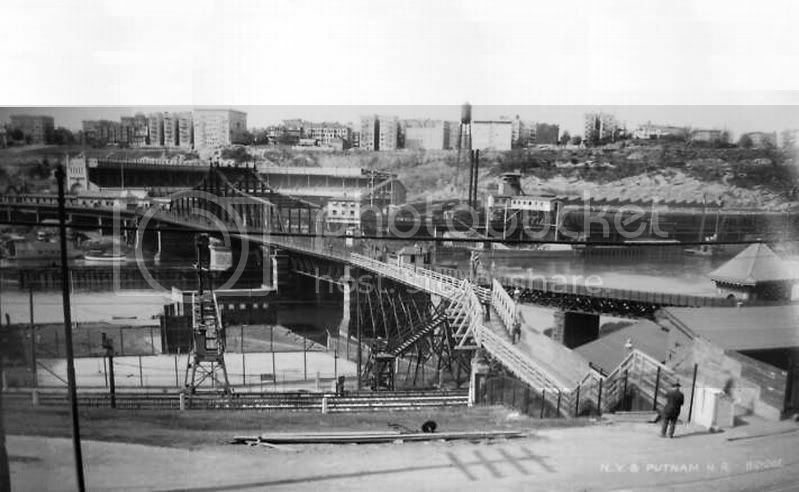 This image shows the NY and Putnam RR bridge to the Ninth Ave El Terminal at the Polo Grounds at 155th St and Eighth Ave prior to the 1918 reconstruction. Note the pedestrial footbridge and the RR line curving North. The IRT Sedgwick Ave Station looking east into the tunnel to Anderson Ave. The IRT Composite cars identify the train as a Polo Grounds Shuttle train on the former extension of the Ninth Ave El.